Just sharing something I made for my game. Might be useful for other people. 3 super simple actions that change the 2D Toolkit platform to 4x, 2x or 1x, respectively, when entering a state. Also, I included a template for an FSM that gets the screen width and sets the platform accordingly. Useful for different iDevices. Bear in mind, never really coded anything before. 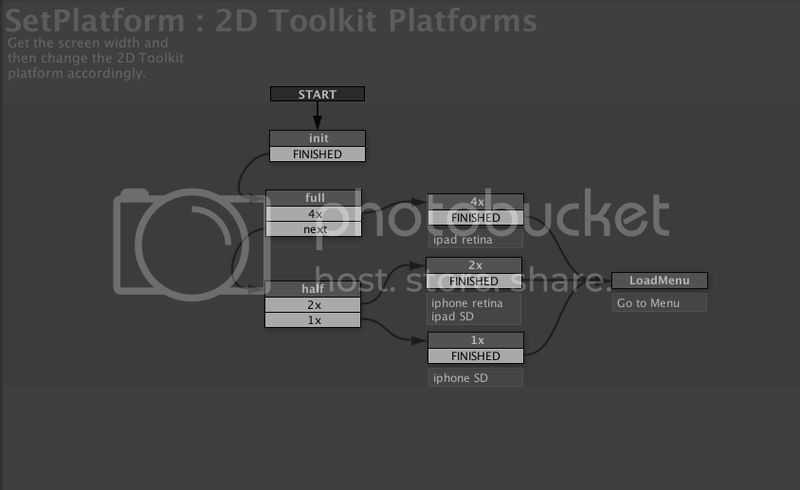 Just copy pasted the 2D Toolkit platform call from their page into an empty action. These need to run before any 2D Toolkit sprites are loaded. Also, if you have the sprite collection editor open, these won't work, as they're also loaded. I had a quick search before to see if anyone had uploaded an action that does this but couldn't find anything. Maybe people just did a script for this, that's a bit beyond me though.